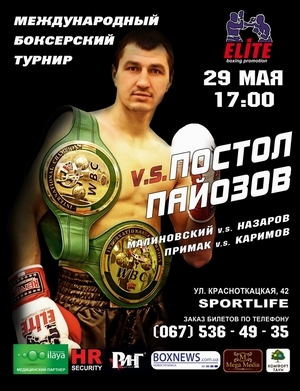 WBC #1 ranked light welterweight Victor Postol (now 23-0, 10 KOs) moved on with his busy schedule by getting a workmanlike decision over rugged Uzbek import Bahrom Payozov (21-3, 15 KOs) yesterday at the Sportlife night club in Kiev, Ukraine. Postol, 29, also rated #13 by the WBO, didn’t put much heart into what was his warm-up fight. He dealt with the limited Uzbek fighter by boxing on the outside, sharpshooting with his jab, adding combinations if necessary. Payozov was competitive and willing but couldn’t put his punches together or corner Postol, eating a lot of leather in return. Final scores were 80-72, 79-73 and 78-74 — for the Ukrainian stylist, who is waiting for his shot at 140lb elite. His biggest win has come this March against «Hammerin» Hank Lundy. Featherweight prospect Oleg Malinovskiy (8-0, 2 KOs) got severely tested by another Uzbek Olim Nazarov (10-2, 7 KOs) in a scheduled six-rounder. Malinovskiy was down in the fourth (what was ruled a slip by referee Vladislav Balabian) but followed with a win on the scorecards: 58-56 and 59-56 (twice). Stanislav Skorohod improved to (4-0, with 2 KOs), outpointing hapless Andrey Danichkin (0-7-1) unanimously over six: 60-54 (x3). Ilya Primak (4-0, 4 KOs) was forced to get off the card after his Uzbek opponent Hokima Karimov (3-1, 2 KOs) failed both to pass medical tests and to make the weight limit.